Organic Bloom Booster is a specialty nutrient formula designed to enhance bloom size and quality. 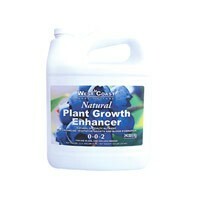 This product assists in the activation of enzymes and aids in the transfer of energy from leaves to flowers. It supplies amino acids and organic acids which help boost the plant during flower production. Organic Bloom Booster provides fully soluble phosphorous and potassium. Natural sugars present in this formula help feed soil microbes and improve bloom size, quality and aroma. This fertilizer is produced using fermentation processes that turn raw plant material into a powerful bloom enhancer. Humic acid produced in the fermentation process aids in nutrient uptake by naturally chelating or binding to nutrients, making them more bioavailable. Use West Coast Horticulture Organic Bloom Booster with Bloom 2-2-4 as part of our organic feed program. Formulated for use in soil, coco and soilless mediums.